Today, no formal national or society guidelines or standards exist for the management of chest tubes in the ICU. As a result, patients routinely suffer from blocked chest tubes and caregivers struggle with ineffective traditional techniques such as milking or stripping. We recommend that in the first twenty-four hours after cardiothoracic surgery, chest tube patency be actively protected to provide complete evacuation of blood and fluid from the thorax. At ClearFlow, we are advocating that clinicians adopt this simple standard of care to protect all cardiothoracic patients from the risks of death and injury that are inherent to the challenges of Retained Blood Syndrome (RBS). We invite you to adopt a Continuous Quality Improvement (CQI) Program to protect chest tube functionality in your hospital. Make it a “Best Practice” and measure the outcomes benefit in health and cost. Together, we can make RBS complications a never event. Slowly slide the Shuttle Guide toward the distal connector (connects to drainage canister tubing) then advance Clearance Wire back into the Chest Tube. Repeat as necessary. Click the Shuttle Guide into the proximal connector during use (Clearance Wire and Loop are inside the PleuraFlow Chest Tube). Slide the Shuttle Guide toward the distal connector (connects to drainage canister tubing) and leave it when the patient is moved or sitting up. The entire Chest Tube and Clearance Apparatus can be removed and discarded in one piece. 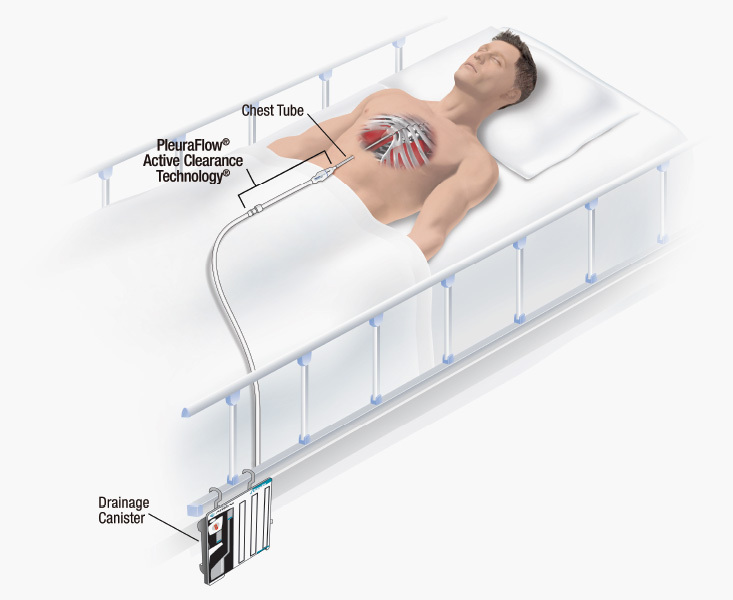 The Clearance Apparatus only can be removed and the Chest Tube can be connected to the drainage tubing. Following the actuation schedule is most critical in the first 24 hours post-surgery. * This should be repeated as necessary to keep the tube patent and free of any occlusions.